As we enter the holiday season one thing we love to do in our house is pullout the seasonal books and movies. It is a wonderful way to add to the festivities. Even the big kids will come sit and watch their favorite characters from when they were little if it is a holiday movie. Disney Mickey Mouse is a newer show on the Disney Channel. This is totally geared towards older children (the ones that outgrew Mickey Mouse Clubhouse.) Having a 6, 15 and 17 year old - we were excited to discover this series. The fab 5 have a totally vintage look to them but the cartoon itself is very modern. They have bigger antics and lots of comedic stints. The characters sing, dance, shove and shout which frankly cracked us all up. 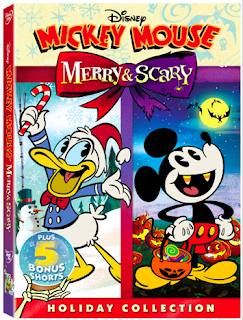 In Mickey Mouse Merry & Scary we have two holiday episodes. The Scariest Story Ever: A Micky Mouse Halloween Spooktacular! Mickey shares scary stories with the little ones. The house is decorated for the spooky fun and we get to see some renditions of classic horror stories like Frankenstein and Dracula. It is a very fun episode. The next episode is Duck The Halls: A Mickey Mouse Christmas Special. Donald doesn't want to migrate for the winter and ends up sick. It is a wildly entertaining episode.